^ "How to get a non-published Bell Home phone number". Support.bell.ca. 17 June 2013. Retrieved 16 April 2014. ^ Jason Zasky. 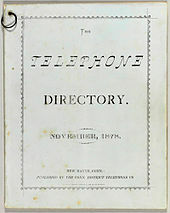 "The Phone Book". Failure Magazine. Retrieved 31 December 2013. ^ "Telephone History in France by". Whitepages.fr. Retrieved 16 April 2014. ^ Paster, Pablo (11 January 2010). "Ask Pablo: What Is The Impact Of All Those Unwanted Phone Books?". TreeHugger. Retrieved 16 April 2014. ^ Guinness World Records 2016. Guinness World Records. 10 September 2015. p. 81. ISBN 9781910561034.